A sprain is an injury to the ligaments around a joint. Ligaments are the strong, flexible fibers that connect one bone to another. When a ligament is stretched too far or tears, the joint will become painful and swell. 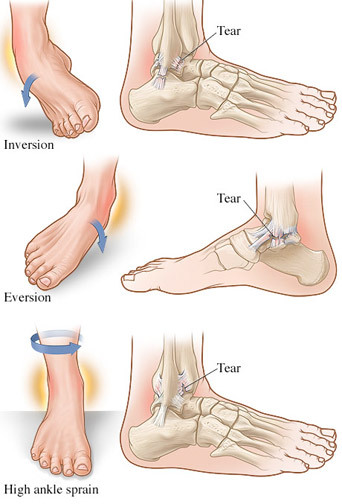 An ankle sprain can range from mild to severe depending on how badly the ligament is damaged. Most ankle sprains happen when you make a rapid shifting movement with your foot planted, like when playing soccer or being tackled in football. A sprain can occur in an event as simple as accidentally rolling your ankle. This condition is a heel pain caused by inflammation of the plantar fascia, the tissue along the bottom of your foot that connects your heel bone to your toes. Your plantar fascia acts like a shock-absorbing bowstring, supporting the arch in your foot. If tension becomes too great, it can create small tears in the fascia. Repetitive stretching and tearing can cause the fascia to become irritated or inflamed. The band of fascia may swell and become painful. This is one of the most common foot-related orthopedic complaints.